If you’re missing even one tooth—or even several—then you know what the obvious difficulties are. First, you may not be able to eat some of the foods that you enjoy most, as well as those that are important to a healthy and nutritious diet, such as fresh fruits and vegetables. Secondly, speaking clearly may be a challenge, because our teeth play a vital role in word formation. Last but certainly not least, you may feel self-conscious knowing that people can see your missing tooth when you smile or laugh. Why Choose Robison Dental Group for Dental Implants? Beyond these obvious problems, there are others that you may not even be aware of. For example, just one missing tooth can cause adjacent teeth to shift, which can lead to bite problems. Missing teeth increase the likelihood of tooth decay in your other teeth, as well as the chances of gum disease. And did you know that a tooth root helps support jaw health? When you lose a tooth all the way to the root, your jaw begins to dissolve as the bone is no longer needed to support a tooth. Dental implants are the only tooth replacement option that can prevent bone loss, and that’s because they are comprised of two parts. The first is a biocompatible titanium post that replaces a tooth root. The post is surgically placed into the jawbone beneath the space left by a missing tooth. Over time, the post and bone fuse together, forming a symbiotic relationship that is like that between a natural root and bone. 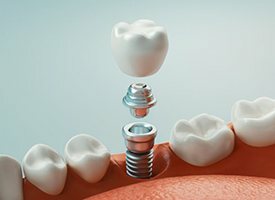 The second part of a dental implant is the tooth restoration, usually a porcelain or ceramic crown, which is anchored in place by the titanium post. Thus, dental implants provide stability, strength, and longevity. Dentures and partials can also be attached to dental implants, giving you options for greater flexibility. 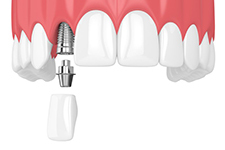 For the most natural look and feel, dental implants are the best choice in tooth replacement. 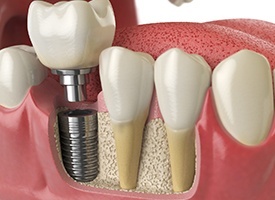 A single dental crown can be attached to an implant post using a small connector called an abutment. 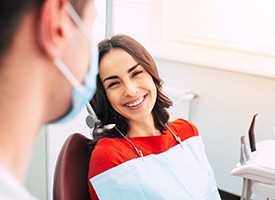 Unlike with a bridge, this new tooth won’t require the surrounding ones to be altered in any way, nor will it need them for support, better preserving a patient’s natural smile. With just two dental implants, we can replace three or more missing teeth in a row. Two dental crowns will be positioned on either side of the gap in a patient’s smile, and these will support a strong and reliable bridge. Implant bridges not only look more natural than traditional ones, but they can be trusted to last longer as well. Instead of replacing each tooth individually, just four to six implants can be used to secure a full denture directly to the jawbone. 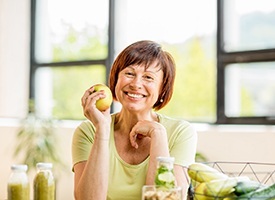 Implant-supported dentures have a much stronger hold than a traditional removable prosthetic, plus they can help bring back more of a patient’s bite strength, enabling them to enjoy a more varied diet with ease. For the surgical placement of implant posts, Dr. Robison will refer our patients to one of his partner oral surgeons or periodontists. These specialists have literally placed thousands of implants over the course of their careers, ensuring both a successful treatment as well as a smooth recovery for our patients. After a patient has had time to heal from their placement (which can take a few months), they’ll return to Robison Dental Group to receive their permanent restorations. Dental implants are quite versatile and able to help patients with varying degrees of tooth loss, and because of this, the overall cost of the treatment can be quite different from person to person. Factors such as how many teeth a patient wants to be replaced, where they are located in the mouth, and what kind of restoration is used can all influence the final price. While dental implant restorations do tend to cost more than other traditional options, they are actually the best financial choice long-term. Why? Largely thanks to their longevity. Regular bridges and dentures typically need to be completely redone every 7-10 years, multiplying their costs, while dental implants can be expected to last for 30 years or more. As a result, implant patients are able to avoid the periodic maintenance and retreatments required by other restorations, saving them thousands over time. Choosing dental implants to replace your missing teeth is a big decision. It is natural to have plenty of questions about the treatment and process to complete your smile. We want you to feel confident in your dental prosthetic choice. We take the time to carefully answer your questions and address your concerns. We have the FAQs you need about dental implants to make the right choice for your smile. Robison Dental Group in Canton, Michigan serves patients from Ann Arbor, Northville, Westland, and Plymouth, providing the area with general, cosmetic, and restorative dental care.